The increased demand for wireless devices has resulted in less wireless spectrum being available for broadcasters and other users. To help ensure successful visits for our guests, Rogers Place and its related facilities are controlled RF environments. 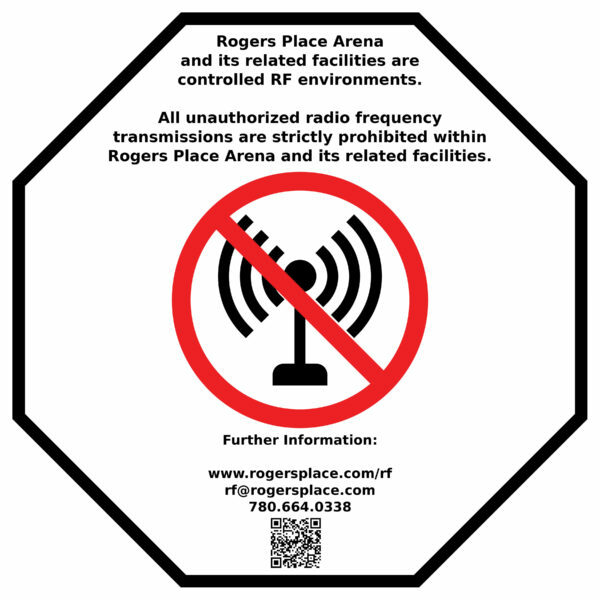 All radio frequency transmissions within the range of 470 to 700 MHz are strictly prohibited within Rogers Place Arena and its related facilities without specific approval from building management. To request an approved frequency, follow the steps outlined below. Note that requesting approval does not guarantee that a frequency will be issued. Any granted frequencies are only approved and valid for the day requested expiring 6:00 am the following day. Description of why using a cabled device is not possible. Email these details along with your contact information to rf@rogersplace.com at least 24 hours in advance of visiting the facility to have the requested frequency coordinated. For on-site requests either call 780.664.0338 or visit the VPCR (AR.02.7.11) and ask to speak with Engineering. Please note that although there is no guarantee on-site requests can be coordinated in a timely manner, every attempt will be made to fulfill on-site requests on a first-come, first-served basis pending technician availability. All issued frequencies will be checked against both the measured noise floor and all other issued frequencies. An attempt will be made to guard against most intermodulation products but restrictions might be relaxed in certain circumstances. It is requested that transmitting power be set to minimum levels where possible. If interference is suspected on an assigned frequency, please first ensure the equipment is operating properly. If the issue is determined to be RF related, either call 780.664.0338 or visit the VPCR and ask to speak with Engineering. A new frequency will be issued and the interference investigated. In order to ensure optimal RF performance in the building, noise floor levels are regularly characterized. This captures all stray EMI and external transmissions bleeding into the building. Obviously, transient sources of interference are not captured. The characterization process involves a 10 Hz VBW/RBW peak detecting sweep of individual 6 MHz blocks in the range of 470 – 698 MHz. The dataset includes about 18,000 points spaced approximately 13 kHz apart. The most recent sweep was done on October 7, 2016. If a copy of the dataset is required to coordinate RF for a visiting show, please email rf@rogersplace.com, contact Engineering at 780.664.0338, or visit the VPCR.